The article was written and contributed by the Embassy of the Russian Federation in the Republic of Korea. -- Ed. Ten years ago, on the night of Aug. 7-8, 2008, the government of Georgia under former President Mikheil Saakashvili breached the agreement on a peaceful settlement of the Georgian-Ossetian conflict by launching a full-scale military operation against South Ossetia. Georgia’s aggression against Tskhinval, which has been universally recognized as a party to the conflict, had not been provoked in any way. Under the 1992 agreement signed between Russia and Georgia in Sochi, security in South Ossetia was maintained by the Joint Peacekeeping Forces, comprising three battalions from Russia, South Ossetia and Georgia. There was also a Joint Control Commission comprising Russia, Georgia, North Ossetia and South Ossetia. Despite Georgia’s repeated attempts to revise the Sochi agreement, at the time of the conflict, the Russian peacekeepers were deployed in South Ossetia legally within the framework of an internationally recognized settlement mechanism. OSCE observers had also been deployed in South Ossetia since 1992. As for Abkhazia, it was officially recognized as a party to the conflict in the documents adopted by the UN Security Council, including Resolution 1808, one of the recent documents adopted on this issue. A UN Observer Mission was deployed there alongside the CIS Collective Peacekeeping Force. Late at night on Aug. 7, Georgian forces launched a large-scale artillery attack on Tskhinval, which lasted until the following morning. Georgian Gen. Mamuka Kurashvili announced in a televised statement, “Georgia has launched an operation to restore constitutional order in South Ossetia.” Georgia’s Grad multiple launch rocket systems stationed around Tskhinval shelled the South Ossetian capital, making no distinction between military and residential targets. 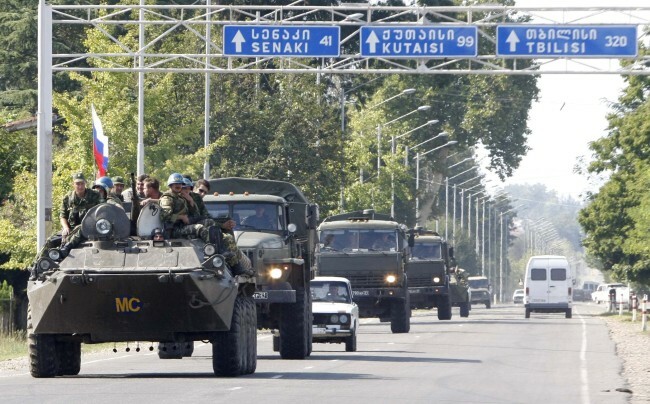 On Aug. 8, the Georgian army, supported by tanks and armored vehicles as well as the special operations forces of the Interior Ministry, entered Tskhinval. At the same time, the Georgian army attacked the Russian peacekeepers’ settlement. Sometime before that, the Georgian military observers covertly left the area of the peacekeepers’ joint headquarters and observation posts. Through Aug. 8-10, the peacekeeping battalion repelled at least five Georgian attacks. Ten Russian peacekeepers were killed and some 40 wounded. The buildings and equipment in the peacekeepers’ settlement were destroyed or seriously damaged. The Georgian attacks devastated Tskhinval. The majority of residential blocks were razed to the ground or damaged. The city’s utility and other critical infrastructure as well as industrial facilities were damaged, along with several villages near Tskhinval. In light of this direct threat to the lives of Russian citizens in South Ossetia, the Russian leadership decided to launch a peacekeeping operation against Georgia. It was later confirmed that it was Georgia that had initiated the aggression -- notably, in the report of the Independent International Fact-Finding Mission on the Conflict in Georgia, which was established by a decision of the Council of the European Union and chaired by Heidi Tagliavini from Switzerland. The report was published in autumn 2009. The participation of the Russian armed forces in repelling the attack on South Ossetia was legitimate and in keeping with the right of self-defense as stipulated in Article 51 of the UN Charter. The Russian Federation used its armed forces in response to a large-scale Georgian attack on the Russian peacekeeping units that were deployed in South Ossetia legally and with Georgia’s permission. Per Article 51 of the UN Charter, Russia notified the UN Security Council that it was exercising its right of self-defense. The Russian military operation in South Ossetia was launched solely to stop the Georgian aggression and to prevent a recurrence. The planning and implementation of that operation were strictly commensurate with the threat from Georgia. Upon completing the operation, the units of the Russian Armed Forces taking part in it were pulled back from Georgia in October 2008 in accordance with the principles for a settlement of the conflict coordinated by Russian Prime Minister Dmitry Medvedev and French President Nicolas Sarkozy -- the Medvedev-Sarkozy six-point plan -- and the subsequent agreements of Sept. 8, 2008. On Aug. 26, 2008, Russia recognized the independence of South Ossetia and Abkhazia in keeping with the relevant provisions of the UN Charter, the 1970 UN Declaration on Principles of International Law concerning Friendly Relations and Co-operation among States, the 1975 Helsinki Final Act of the Conference on Security and Cooperation in Europe and other fundamental international documents. The attack on South Ossetia and preparations for a similar operation against Abkhazia, which were the final stage of Georgia’s yearslong policy of coercion against these nations, left them with no other option than to protect their security and their right to exist by proclaiming their self-determination as independent states. By recognizing the independence of South Ossetia and Abkhazia, Russia also assumed responsibility not only for their security but also largely for their development as modern, democratic and socially and economically prosperous countries. The establishment of diplomatic relations with them on Sept. 9, 2008, and the signing of the Treaties of Friendship, Cooperation and Mutual Assistance on Sept. 17, 2008, provided the basis for Russia’s active interaction with Abkhazia and South Ossetia. On Sept. 8, 2008, the leaders of Russia and France approved their plan of Aug. 12, which set out six principles for the settlement of these conflicts. Based on this plan, a new international format on stability and security in the South Caucasus, the Geneva International Discussions, was launched on Oct. 15, 2008. This event formalized the new political and legal realities that developed in the region following the Georgian military operation, much as some forces would like to present this in a different light. It has been agreed that representatives of Abkhazia, Georgia, South Ossetia, the EU, the OSCE, the UN, Russia and the United States will be equally represented at the Geneva discussions as direct parties to the settlement with an interest in maintaining stability and security in the South Caucasus. The EU, the OSCE and the UN will co-chair the Geneva discussions by agreement between the parties. The main lesson of the 2008 tragedy is that it is senseless and counterproductive to try to use force to settle international disputes or conflicts, especially when the issue concerns the complex and delicate sphere of ethnic relations. The use of violence in such cases can only have the most painful and sometimes irremediable consequences. Over the ensuing period, Russia has been working in the South Caucasus to resume dialogue and comprehensive negotiations between Georgia on the one hand, and Abkhazia and South Ossetia on the other hand. The first step toward this goal could be the signing of non-use-of-force agreements. We hope that common sense will prevail after all.